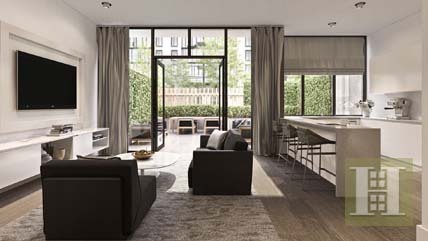 Located on the north and south sides of the building, the breathtaking multi-floor, 3,300 square foot, 3- and 4-bedroom townhouses designed by Piet Boon offer the benefits of a single-family home coupled with the amenities of a luxury building. They enjoy extra-wide (25- foot) widths, 10-foot ceiling heights and flexible layouts, as well as custom millwork for additional storage, a suite of Viking and Smeg appliances, a gracious master suite with his + hers closets and en suite baths. The chef's kitchen with pantry overlooks a private garden area with its own plunge pool. A private entrance and direct access to a private enclosed garage allow for complete privacy. . Designed by acclaimed architect Piet Boon, Oosten sets a new standard for living in Williamsburg, if not all of Brooklyn. Dramatic in scope, every home - from townhouses and duplex homes to lofts, one, two and three bedrooms to duplex penthouses - enjoys thoughtful layouts and abundant light and air. In many of the units, multiple casement windows open onto the beautifully landscaped courtyard, transforming your living room into a virtual terrace. Unquestionably modern, Boon's style boasts a classical touch that is evidenced by his affinity for pure, organic materials and a subdued palette. His designs for Oosten have the kind of timeless appeal that one rarely thinks of when speaking to contemporary trends, making it refreshingly distinctive. Oosten also features an unprecedented level of amenities. Two lobbies, a 24-hour concierge, an enormous courtyard, a landscaped rooftop with reflection pool, a gorgeous lap pool, as well as a lounge and a children's playroom, and a fitness center with a spa have all been specially created with the Oosten resident in mind.